I’m not sure if I’m excited or nervous at the prospect of the ‘live blog’. I’ve done similar things in equally high profile situations, running the live text commentary for a couple of Mr Brown’s Budgets whilst working at Sky News (1998, I think – wow, ten years ago)… but I’m effectively appointing myself the Prime Minister’s Online Spokesman for the day, which is kind of nuts now I think about it. And very trusting of them. It’s bound to attract more than its fair share of malicious and frivolous participants. But it’s a first, certainly in UK government, and almost certainly globally (unless you know better? ); and it’s another innovation to add to the list. I’m particularly looking forward to using the CoverItLive tool. Full report to follow, naturally. Fresh from its success with Twitter, 10 Downing Street is preparing for a weekend of social media experimentation, in association with Puffbox. This Saturday, Gordon Brown is hosting a gathering of around 20 left-leaning world leaders under the banner of Progressive Governance, to discuss globalisation, climate change, development and international institutional reform. (It got a brief mention in yesterday’s monthly press conference, but you’d be forgiven for missing it.) With the renewed appetite for online experimentation at Number 10, I was asked to put together a microsite for the event – running on WordPress, and incorporating a few ‘web 2.0’ tools and tricks. The centrepiece will be a live video stream of the proceedings, with a text commentary / discussion thread alongside. You could call it ‘live tweeting’, but we’re probably not going to use Twitter (tbc though). We’ll be posting the conference’s discussion papers for online viewing, with the opportunity for you to post your comments alongside. We’re hoping to get photos beamed into the site from the conference venue, via Downing Street’s new Flickr account; their well-established YouTube channel may also come into play. As may anything else which crosses my mind in the meantime. It’s an ideal opportunity for innovation: a one-off, relatively low-profile event, not exactly on the scale of a G8, but still significant enough to be taken seriously. The ludicrously tight timeframe is forcing us to make rapid, almost instinctive decisions: in my book, that’s a good thing. If you’re interested to see what we make of it, believe me – so am I. It all happens on Saturday morning, with the live proceedings due to wind up in the early afternoon. With Arsenal-Liverpool Round Two kicking off at 12.45pm, I’m relying on my fellow Gooner, David Miliband to ensure things stay on schedule. The Asus Eee mini-laptop is the new Wii: the ultra-cool white gadget that clearly surpassed its manufacturer’s best sales projections. I was lucky enough to find one on sale in Tottenham Court Road a few weeks back, at list price too, and it was the guy’s easiest sale of the day. What makes the Eee special? 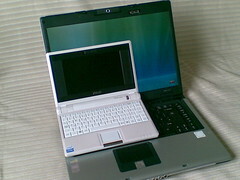 Its portability: as you can see, it’s much smaller than a conventional laptop, and much lighter too. Its cost: just £219 for the most popular model, but it’s still fully-spec’ed. But most importantly for me… its boot-up time. You’re up and running in 15 seconds, online in about 30. And interestingly, it’s a conversation starter. Total strangers on the train ask me about it. I whip it out in meetings to take notes, and the conversation inevitably deviates for a minute or two. As Hugh MacLeod might say, it’s a ‘social object‘. When you’re living the freelance/consultancy life, things like this matter. The Eee allows me to quietly communicate a few things about my view of life and business, without having to say a word. It’s quick. It’s not unnecessarily expensive or extravagant. It’s adaptable. It challenges the norm. I’ve yet to say the words ‘very much like myself, actually’ – but I think the message gets through. Meanwhile, my former Big Ugly Laptop is gathering dust in the corner. Vista is a distant memory. Result all round, I’d say. I got an email from the team behind BBC News 24’s Your News show during the week, asking if I’d record a contribution as part of a piece they’re planning about – guess what – Civil Serf. So here it is, as a Puffbox first-play exclusive. We’re exceptionally proud to unveil the latest Puffbox site: a new corporate website – or indeed, two – for the Wales Office. And as you’d probably expect from us, it’s not just another government website. In late 2007, I was invited over to the Wales Office’s Whitehall HQ. I hope they don’t mind me saying, their website was probably the ugliest in government, and people were starting to take notice. They had no hands-on control of their own content, and no site usage data. Could Puffbox help? Yes, yes we could. The new site, which we’re launching today, was designed, built and populated in a timescale (and for a budget) which would put many suppliers to shame, and gives them functionality which many of their Whitehall neighbours will envy. I also believe it could spark a culture change in how government communicates. Regular readers won’t be surprised to hear it’s built on the WordPress ‘blogging’ platform, and continues our series of ‘blogs which aren’t blogs’. News releases, speeches, publications and FOI disclosures are all entered as ‘blog posts’, distinguished using categories. All the more static, corporate stuff is done as ‘pages’. For the readers, there are immediate benefits. Obviously, it’s prettier. It’s been coded with better accessibility in mind. Every page is automatically printer-friendly, using CSS. The blogging mechanism gives reliable, automated archiving by category and month. Not to mention the various RSS feeds. And as you’re legally entitled to expect, there’s a fully-functional Welsh-language version too. Why do I see it as a culture-changer? The site is being run by the Press Office, a small team in a small department (60 staff). They have the authority, and now the ability, to publish new communications at a moment’s notice. If they want to operate by ‘bloggers’ rules’, they can. And as I recall Tom Steinberg once saying, it’s the tools which are transformational. Let’s see what happens… and if they make a success of it, expect others to follow. Everything seems to have rolled over successfully, so I think I’m now safe to talk about the new Puffbox.com site. The majority of Puffbox’s work since launching in April 2007 has been based around WordPress. I make no secret of my feelings for the product; so it was only natural that, at some point, I’d want to take control of my own affairs and build a self-hosted WordPress site from scratch. I found plenty of excuses not to abandon my long-established WordPress.com blog, but in the end, two milestones forced my hand: passing 50,000 page views, and Jeremy Gould‘s announcement of tomorrow’s UK Government Barcamp. As ever, a fixed date in the calendar soon focused the mind. An immediate question arose: which was more important, the blog or the company background? In the end, the blog won on points. For me anyway, the blog’s (almost) daily stream of news and opinions is the best indication of what I’m about. But the site still needed a solid corporate side, otherwise it was going to look like an amateur blogger in search of pocket money. Hence the split homepage, with a clear colour distinction between ‘company’ (white) and ‘personal’ (green). I designed it in collaboration with Jonathan Harris, a former colleague at National Statistics, now working freelance; he’s also done another piece of work with me, which we’ll unveil next week. All the templates were coded from scratch, although I took some inspiration from the Hemingway WordPress theme(s): particularly as regards the very vertical presentation, with the sidebar becoming a footer. Icons come from the Milk and Green set. The homepage ‘grid’ layout of recent posts is done using multiple WordPress loops, a technique I’ve had to perfect for several recent client projects. I’ve learned a few lessons in building the site, but most important of all is that you should always redirect your main RSS feed through Feedburner from day one. What a relief it was to flick the switch from old site to new, and see the subscriber base carry over (almost) seamlessly. The Feedburner stats are nice to have, but they are nothing compared to the convenience of having a perma-URL for your feed. Now it’s all free, there’s no excuse not to. Today sees the launch of version 2 of the website I designed and built for Lord Darzi’s national review of the NHS. V1 was built in double-quick time during the summer, and for reasons of cost and speed, used the Typepad blogging platform. Over the last month or so, Typepad’s limitations have become more and more apparent… so it was time to migrate to WordPress. Which, of course, is what I’d always wanted. All the juicy new stuff hangs off the homepage. ‘Latest news’ is (as you’d expect) a listing of the top news updates, using a special ‘homepage’ category to give the authors total control. ‘Lord Darzi’s blog’ is the latest blog to be written by a government minister, but unlike some, we’re positively encouraging comments. Finally, there’s the ‘latest video’: the review team is producing quite a lot of video content, so we’re sticking it on YouTube, and using YouTube’s little-known RSS feed functionality (with a bit of string manipulation) to pump it back into the site. The primary navigation is a mix of blog categories and static ‘pages’: hey, if you dig deep enough, there’s even an old-school image map! How long is it since I did one of those? We haven’t made any distinction between the two; I’m not sure it really matters to the punters. As it’s WordPress, we’ve got full comment functionality if we want it. The plan is that blog posts should generally have comments enabled, but news posts won’t. However, if we fancy it, we can. To draw attention to the items where comments are ‘on’, there’s a little speech bubble icon which appears against the relevant headlines. A minor thing, but it catches the eye really well. Overall, it’s taken less than a week to recode the templates, develop the new functionality, and import the content. Importing from Typepad was relatively painless: the initial process took seconds, but then you’ve got the hassle of setting summaries for each item, identifying and repointing all the manual inline links, etc etc. I’m glad there wasn’t too much content to worry about. DNS changes and server reconfiguration took about a day and a half, which was a real disappointment, but at least it’s done now. I’m really pleased with it; the initial site was OK, particularly given the laughably short timeframe, but I knew we could do better. I’m afraid the exercise has put me off using Typepad, though: although it does have some pseudo-CMS functionality, my feeling was that it’s too tied to the concept of blogging.